STA. LUCIA coach Sammy Acaylar was not too disappointed even as the woes piled up for the Lady Realtors in the Super Liga. 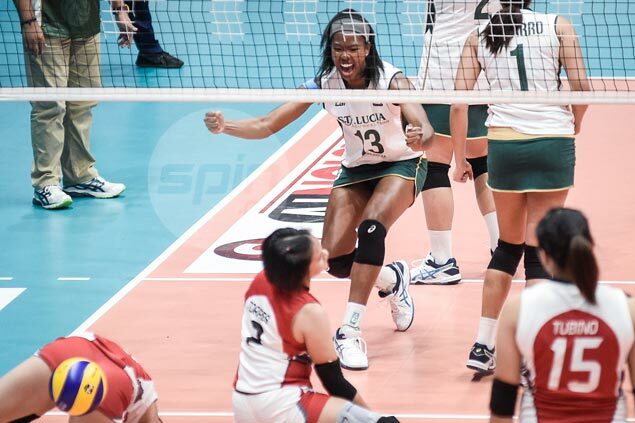 The Lady Realtors went winless in the 2017 PSL Invitational and the tough run continued on Thursday with a loss to Cignal. But new coach Acaylar, seeing positives in the five-set loss, believes they won’t be staying in the cellar for long. "I told my team na Cignal is not just Cignal. They are a champion team. But they are human. They make mistakes, we make mistakes. Tao sila, puwede silang talunin," said Acaylar. One of the reasons for Acaylar’s postivie outlook is the debut performance of Fil-American Mar-Jana Phillips. Phillips, Sta. Lucia's prized find from NCAA Division III school Juniata College, topscored for the Lady Realtors with 16 points. "From the start, hindi ko siya masyadong inaasahan kasi she is new in the Philippines," said Acaylar. "But she has the character to play. She didn't have any pressure." The 6-foot Phillips was named to the Landmark Conference all-second team while with Juniata College. Acaylar said he also likes Phillips attitude. "She told me she just want to play for Sta. Lucia because she has an ambition to be part of the national team. There are little things na kailangan pang ayusin like 'yung service receive. A little more adjustments," said Acaylar. Also contributing for the HD Spikers was Danika Gendrauli, who had 15 points.